Bruce Springsteen has announced a limited-edition, numbered box set, Bruce Springsteen: The Album Collection Vol. 2, 1987-1996, out on May 18 via Columbia Records/Legacy Recordings. This new collection follows Springsteen’s 2014 release, Bruce Springsteen: The Album Collection Vol. 1, 1973-1984, which included newly remastered editions of the first seven Bruce Springsteen studio albums. The vinyl box set includes Springsteen’s four studio albums from the era, plus two EPs and a double-LP live album. These four LPs have been long out-of-print and have been remastered for the first time on vinyl. The LPs include 1987’s Tunnel Of Love (2 LP), 1992’s Human Touch (2 LP) and Lucky Town (LP), and 1995’s The Ghost of Tom Joad (LP). All four of these albums were certified gold, platinum or multiplatinum by the RIAA. The two EPs include a 12” of 1988’s live EP, Chimes of Freedom and the first-ever vinyl release of the 1996 Blood Brothers EP. The double-LP live album is Springsteen’s 1993 MTV Plugged special. The boxset will include a total of 10 discs with recreations of the original packaging and a 60-page book with rare photos, memorabilia and original press clippings. 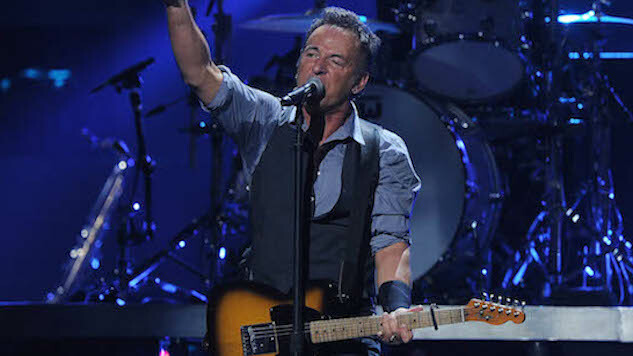 The albums were remastered by Bob Ludwig and Springsteen’s longtime engineer Toby Scott. They were transferred from the original analog masters using the Plangent Process playback system. Tunnel of Love and Human Touch have also been expanded to double LPs to maximize audio quality. Check out the new box set below, which will be available for preorder tomorrow, March 30, and watch a 1978 Springsteen performance from the Paste Cloud further down. Coming May 18 — Bruce Springsteen: The Album Collection Vol. 2, 1987-1996, a limited-edition, numbered boxed set comprised of material recorded and released by Springsteen for Columbia Records during that period.